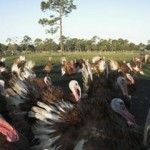 "Turkeys At Crazy Hart Ranch"
I have a new friend in Fellsmere Florida. 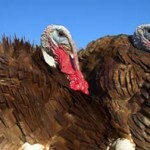 Linda Hart of Crazy Hart Ranch is raising pastured chickens and turkeys for the production of meat and eggs that are of a quality one can not find in the grocery store. 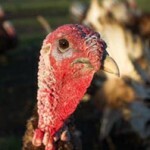 I am an omnivore who refuses to eat creatures that were treated like commodities. I am offended by the criteria allowed to meat producers for classifying their meat as ‘free range’. That laxness has caused those words to mean nothing, and so food producers who treat their creatures humanely, who allow their yard animals to live and feed in and on grass are now calling their quality style of meat production ‘pastured’. Pastured meat is by far less fatty. Pastured meat is lower in the LDL ‘bad’ cholesterol and higher in the HDL ‘good’ cholesterol as well as antioxidants; including vitamins E, beta-carotene (vitamin A), and Folic acid. Pastured creatures are less likely to be ill and don’t need preventive doses of medications. 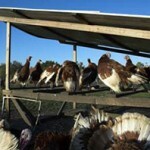 The chickens and turkeys at Crazy Hart Ranch are penned outside in grass, walking around and foraging in the grass. They are not sedentary, and they don’t rely entirely on feed grains for their dietary needs. I was at Crazy Hart Ranch for a visit the other day. I was shoveling out a pen where chickens had lived. The manure compost I shoveled out of there was the most amazing I have seen in a while. The community of worms, beetles, millipedes, sow bugs, earwigs and other bugs I can’t name was huge. That was the most alive manure compost I have ever seen. It is for sure a testament to the health of the chickens that were living there. 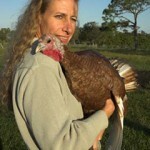 I find Linda at the Fort Pierce Farmers Market every Saturday morning where I can buy eggs (if I am there early enough), and chickens she has processed herself. That food tastes fabulous, and the pan drippings from one of her chickens roasted makes a golden rich broth for perfect soup every time. I am old enough to remember when food from the grocery store tasted like that. It doesn’t anymore. I like that Linda raises her chickens and turkeys from the very beginning, and she is in charge when it is time for processing. She rents a processing plant and oversees the entire operation. All eggs sold at the grocery store by order of the USDA have to be washed in a dilute bleach or disinfecting solution. That solution washes the eggs protective coating off, air leaks in and the egg begins to lose its freshness. Organic eggs at the grocery store are raised on Organically grown grains like soy and corn. The grains had no pesticides on them and were not grown with chemically created fertilizers, but they were not fed on grass. Oh, are they marked free range? That can mean that the chickens had a half an hour per day out of the cage on the warehouse floor. The hens that laid those eggs weren’t raised on grass. The eggs’ nutritional value is no better than the eggs not marked Organic. It is grass that gives goodness to food. Buying eggs outside of the grocery store is the way to make certain they are fresh, and buying pastured or grass raised food is the most nutritious for us and the most humane for the hens. In a recent e-mail Linda wrote, “Isn’t is amazing the simplistic design of nature? No high powered feed rations or expensive confinement facilities necessary. If we can quit being control freaks and allow animals to be themselves they will produce the healthiest food possible for us. We merely have to empower them to do what comes natural.”. Beautiful Linda. 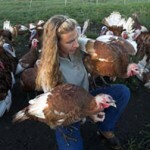 If you are a meat eater I suggest you try out the eggs and chickens from Crazy Hart Ranch. Only prepare to be hooked. 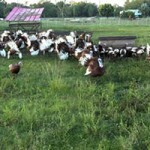 There is a tangible difference in the taste and texture of a pastured poultry, and pastured eggs. Support Your Local Farmers and Ranchers, Buy Fresh Food. a real problem all human food consumers face.